Drawing a map of the home will tremendously help with the installation of Christmas lights on the front eaves. This map will help determine how many lights will be plugged into the extension cords, where the lights will be installed, how long to create the light stringers, and how many of each clip to install on the cord. The number of lights on each gutter and peak should be added to the map. The estimation methods below are used to approximate the footages. If using 15" spacing C9 cord, the footage must be multiplied by 0.8 to obtain the number of bulbs per run. Once a completed map is drawn, the map can be used to create stringers with a close number of bulbs and respective shingle tabs and gutter clips as well as male connectors. Maps are drawn on a grid paper with each grid representing approximately five linear feet. The peaks of the home are drawn from a front facing view as angled lines. Gutters parallel to the street are drawn as horizontal lines. Gutters that are perpendicular to the street are drawn as vertical lines. The solid lines being drawn represent Christmas light stringers. Solid lines should not intersect. Use dotted or dashed lines to represent extension cords. A solid circle represents male connectors on the stringers. 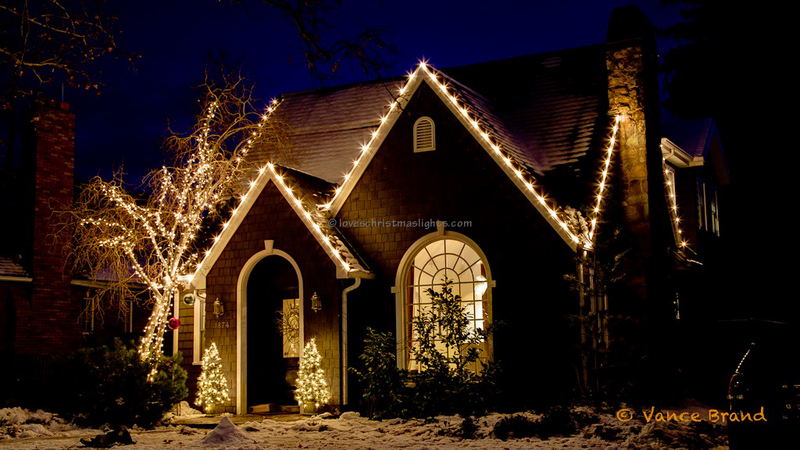 A typical home decorated with Christmas lights. A map of the above home showing the Christmas light stringers. Once the map has been drawn roughly to scale and includes all the eaves and gutters which are to be decorated, the number of lights must be estimated. 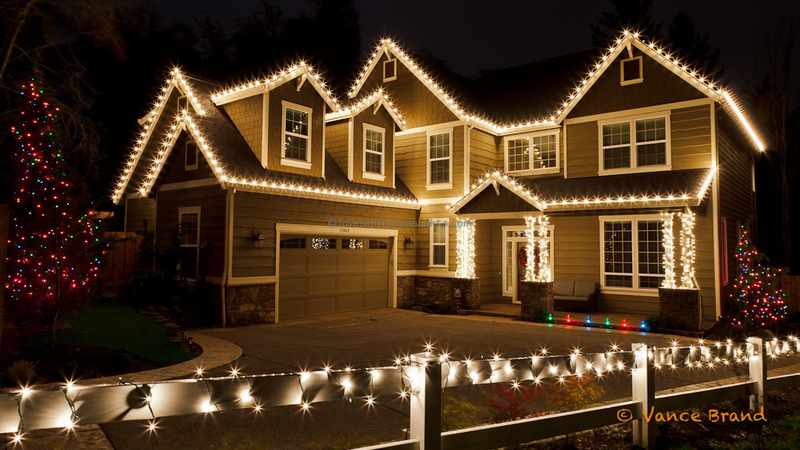 Estimate the lights on each peak and gutter as they use different clips. This map will be used to create the stringers. Count the number of shingle tabs (st) and gutter clips (gc) for each stringer and mark on the map. Peaks are denoted by angled lines. The slope of the lines does not need to be the same as the roof pitch (steepness), but try to draw to scale. Gutters parallel to the street should be represented on the map as a horizontal line. Gutters perpendicular to the street should be drawn as vertical lines. Draw extension cords as dotted or dashed lines on the map. These will be connecting two stringers, running to a power source, or plugging in wreaths, trees, etc. Draw the eyebrows on the map for a more descriptive map. No need to label male connectors on the eyebrows or show them as an independent line. On some homes, there is a peak directly above a gutter. 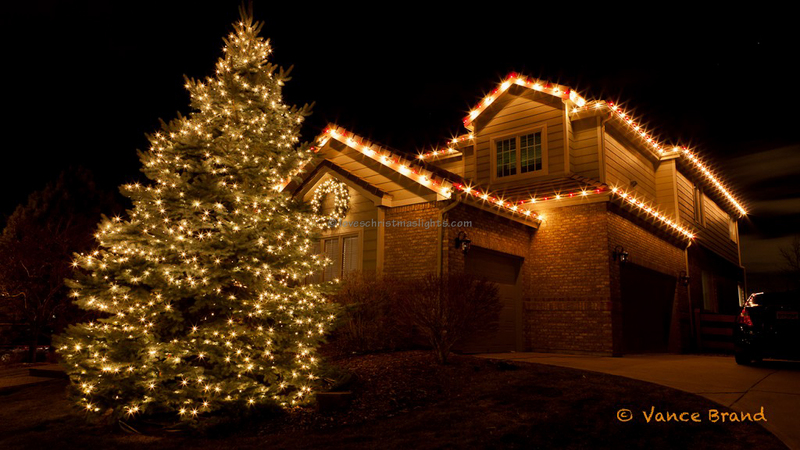 One Christmas light stringer should run along the gutter without any cuts. Another stringer with a male connector should decorate the peak and plug into the gutter stringer. Male connectors should always be located on the side of the stringer closest to the power supply. In the following image, the bottom method is correct. A smaller peak sits in front of a larger peak on some homes. Decorate the entire smaller peak first and use another stringer for the larger peak. The top image is the correct method of decorating these peaks. Below are more examples of common rooflines. There are a few ways to estimate the footage each stringer will need to be. The easiest method is to count individual shingles or bricks on the home. Other methods may include a rough estimation based on experience or using a tape measurer. Counting bricks on a brick sided home is an easy and accurate way to estimate the footage of gutters and peaks. Each brick is typically 8". Just count the full bricks under the gutter. Multiply the number of bricks under the gutter by the length of a brick and mortar then divide by 12 inches to obtain the footage. Add two feet for the soffit if it extends beyond the wall. Counting shingles is another accurate way to estimate footage for gutters. Each tab on a three-tab shingle is one foot. Simply count the number of tabs. A bit trickier, look for the cut in the shingles. Each section is three feet in width. Each tile is approximately one foot, but measure just in case. Count the tiles to get the footage estimation. Each row of three-tab and architectural shingles are approximately 6". Count the number of shingles on one side of a peak and divide by 2 to determine the footage of one side of the peak. The other side of the peak is typically the same length. Rather than counting bricks and shingles, one could also use a measuring tape to measure each peak and gutter run, though this will require climbing a ladder or onto the home. This method will be the easiest and most accurate.